If you are a person who cares about the welfare of children, childcare volunteering will be the best project to take up once you are in Uganda. There are so many homeless babies and orphans that need your care and support. Among the challenges faced by these children include disabilities, poverty and homelessness. Some of these have lost their parents and have no one to turn to. You can put a smile on a Ugandan child by providing the necessary care needed. There are children that have been affected by war and are mentally, physically and emotionally disturbed. They have hope for the future and all they do is to take a day at a time. Your presence may surely be felt by these little angles that have been faced by circumstance. Childcare volunteering team will be more than glad to receive you. When it comes to children, there are no unique skills needed. What is needed is your time and the ability to listen, read, exercise and play with them. The babies’ homes available luck enough staff, therefore you visit is always appreciated. If you travel as a team, this gives the children to enjoy the love and attention without fighting for it. Seeing such innocent children will have your life change for the better and thank God for your life. Many of these homeless babies are born and dumped by their mothers, due to the fact that they can’t’ support them. You may wonder why a mother can give birth to a child and after dump her. Besides the babies’ homes, you will visit the orphanage. These are inspiring children who are always ready to learn. Activities you may engage in with them include dance and drama, group games, painting, board games as well as art workshops. Some of them need counseling because they have failed to cooperate with the rest. When its time for feeding or bathing, cleaning, you may give a hand. Playing with them will rise their self esteem and give meaning to life. After a wonderful experience with the children, you may go on a safari to track the gorillas, chimpanzees or see lots of wildlife. 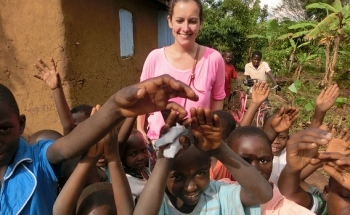 Teaching volunteering is a vita project in the lives of Uganda’s Children. It’s one aspect they always embrace if given an opportunity. If you visited such children and saw where they attend classes from, you would feel miserable. Many of them attend classes under trees and they are always eager to learn. The work that is done by team members include classroom teaching, repair or build schools and hands-on activities. Your presence makes life meaningful and the experience is overwhelming. Such children easily adopt and can learn anything taught. You can engage them in conversational English or informal educational activities.English is quite a problem to children and but they have the ability to speak .The teachers themselves don’t know so much thus they get an opportunity to learn and improve on their skills. Some schools are private but still need a lot of support; teachers are not qualified but use their little knowledge to disseminate information. If they as well get a chance to interact with volunteers, this would improve their lives greatly. Your first day at any school assigned, you are given a chance to prepare your lessons or activities you intend to teach students or pupil. It’s always good to introduce yourself to them so that they get familiar with you. Besides lessons, other activities to engage include dance and drama, music, sports, art and many others. It’s only in Uganda where your teaching volunteering activity may come to reality. Whereas local teachers are expected to help, they may not and so come prepared to handle any work given. Seeing these little children learn what you have taught them, will surely put a smile on your face. The Ugandan children need your help and support. I believe if you are doctor, nurse or health worker, you wouldn’t mind to spare a month or two volunteering in a local hospital or medical clinic. When it comes to health, all is not good with Uganda as a country. The health workers are limited and the drugs are few in circulation. Through medical volunteering, so much can be done to improve the lives of the people. Crucial services needed include pre-natal exams and body checks in local clinics, tooth extractions, homes and village dispensaries and diabetes screenings. There is a lot of work to do by the medical team, among these include testing eyesight, physical check-ups, carry out outpatient surgeries, examine newborns and counsel people as well. The working conditions in Uganda and Africa at large are not that good however providing a hands-on offer to an individual may make a difference in someone’s life. Our communities lack medical facilities and so you are advised to come with your own medical supplies and instruments. As you come down to Africa to give a handle, let this be a life changing experience. Your skills will account and put a smile on the local people. There are HIV/AIDS projects for those who have a passion of helping others. The medical team aims at creating public awareness to the people and how best to protect themselves from this deadly disease. Often times the medical students move from village to village accompanied by the local staff to provide information and visit the sick. Other activities carried out include counseling, providing comfort, giving out basic supplies, spiritual guidance and offering medication to reduce on the symptoms. Willingness and patience are needed to impact change to the people of Uganda especially those affected by the disease.